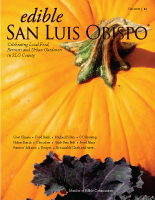 Author’s Note: This interview is reprinted with the permission of Edible San Luis Obispo. The check-in table for Pallet to Palate’s “Farm Fresh” Cooking Demonstration is festooned with a bulging array of fresh eggplants, artichokes, zucchini and strawberries. I am told that the produce comes from the Templeton Farmer’s Market, and that I’m welcome to help myself to anything I like. A very good start. While waiting for the doors to open, I chat with a woman from Atascadero who stumbled upon the event through the pages of EdibleSLO. The concept of “shake the hand that feeds you” struck a chord with her, so she’s giving it a whirl. I munch on display fruit as she talks, acutely aware that I probably have fresh, organic, local strawberry wedged between my teeth. We sit down to a two-hour, three-course meal demonstrated by Chef Robert Root of The Manse on Marsh. Any chef who leaves the fast-track to serve fresh, local food to elders in assisted living is alright by me, but Chef Robert is young, bright, and passionate to boot. He started Pallet to Palate a few years ago to strengthen the connection between chefs and local farmers, hosting annual public events that inspire, educate, and satiate. By all accounts, P2P has become an overwhelming success, and I’m about to understand why. We savor a tender cold melon soup from Rocky Canyon Farms fruit as Chef Robert shows how it’s made. A bottle of 2006 Silver Stone Sauvignon Blanc makes more than a few laps around our table, its brilliant, clean acidity the perfect match for the soup as well as our next dish: a fried green tomato and goat cheese salad with roasted walnuts and balsamic vinaigrette. Robert gives a round of shout-outs to the farmers who stand up looking a little overwhelmed by our enthusiastic applause and whoops of delight. They are – deservedly – the rock stars of our afternoon. When I return the next day for the Let’s Be Frank symposium, I’m still high from meeting other local foodies and swapping favorite farmers like baseball cards. Thus am I perfectly positioned for a panel discussion with three experts: sustainable food entrepreneur Larry Bain, small-farming pioneer Judith Redmond and renowned American chef, Bradley Ogden. If yesterday was designed for the pragmatist, today is for the intellectual. Our panelists are well-versed, policy-hounding advocates of sustainability, discussing Americans’ constitutional right to good food in one breath and government over-regulation of family farmers in the next. The last day of P2P is for the conscious gourmet. It’s the SLOcavore Party, offering more delectable goodies from farmers, chefs, and wineries than I know what to do with. There is a layered Labyrinth Pinot Noir, sweet Italian sausages from Charter Oak Meats, berry tarts in cardamom crusts from Two Cooks Catering, shepherd’s pie from Maegan Loring, and – my personal favorite – a roasted beet risotto cake from Catering Unlimited. Or is it the ginger snap ice cream sandwich from Full of Life Flatbread? After two hours, attendees are shuffling wide-eyed from booth to booth in a local-food-induced stupor. Snagging someone between bites of fruit tart, I ask her impression of this year’s P2P. “It’s the best yet!” she grins, displaying a patchwork of sustainably-farmed strawberry in her teeth. Jaime Lewis left a perfectly good career in orchestra management for a year of farming, eating, and drinking in Italy and New Zealand. She is now a freelance food and drink writer in San Luis Obispo. Read about her odyssey at www.jaimeclewis.wordpress.com.